The Czech Republic is a prominent central European country and is renowned for its numerous ornate castles and its rich medieval history. Apart from this, tourists flock to the Czech Republic to enjoy its unique beer culture. Its capital, Prague, has the famed Prague Castle from the 9th century, with its own medieval town preserved in excellent condition. Also, Cesky Krumlov, a small town near the South Bohemia region, has immense Renaissance, Gothic and Baroque styled buildings which have been turned into commercial establishments and homes by the residents of this region. There is a vast variety of tourist sites offered by this country. To enjoy your trip here to the fullest, always ensure that you have a valid Czech Republic Visa. The Czech Republic is a part of the Schengen Area of Europe. This area consists of 26 mainly European countries which have signed the Schengen Agreement. Hence you will require applying for a Schengen Czech Republic Visa if you plan on travelling to the central European country for any purpose. A person owning a passport of a non-Schengen country, such as India, needs to apply for the relevant type of Schengen Visa before embarking on their journey. For such people, a valid passport, along with several essential documents are required to be eligible for applying for a Schengen Czech Republic Visa. There are several different types of Schengen Visas granted for travelling to the Czech Republic, or the Schengen Area, in general. The Schengen tourist Visa is issued to applicants who plan on travelling to the Czech Republic for leisure purposes. This Visa is strictly for tourism activities and prohibits the Visa-holder from taking part in any commercial or profit-making activities. This is a short-term Visa and allows the Visa-holder a total maximum duration of 90 days to stay in the Schengen Area. The validity of this Visa is for 180 days, and it should be utilized before its validity expires. The Schengen business Visa is a short-term Visa granted to applicants who wish to travel to the Schengen Area for business purpose. This Visa allows the applicant to stay in the Schengen Area for maximum 90 days. This Visa does not allow you to take part in gainful professional activities as a work permit is required to do so, according to Schengen Visa regulations. The Schengen cultural event Visa allows the Visa-holder to travel to the Schengen Area to participate in sports, religious or any other cultural event. This is also granted to members of movie production teams. This short-term Visa allows the Visa-holder to stay in the Schengen Area for 90 days at max. This type of Schengen Visa allows the applicant to travel to the Czech Republic, or the Schengen Area in general, to visit family, relatives or friends who hold permanent resident status in the Schengen country. This short-term Visa allows the Visa-holder to stay with their family or friends for a maximum 90-day period. We have crafted this stepwise method to help you understand the basic steps in the Czech Republic Visa application process. The first step is to determine the exact type of Schengen Visa you will require for your trip to the Czech Republic. This is decided simply by the purpose of your trip to the Schengen Area country. Once you have decided the type of Schengen Visa you should apply for; you will need to download the form. This Visa application form is easily available at multiple sources online. Fill the form carefully and print a hard copy of this form. You will need to book an appointment at the Consulate Section of the Embassy of the Czech Republic to submit the Visa application form along with the necessary documents required to process it. On the other hand, you can also visit any of the Czech Republic Visa Application Centre which is nearest to you. Check to ensure that you are carrying the specified Visa application fees. As soon as the Visa application and your documents are verified, you will be called for a personal interview at the Consulate. This is to enrol your biometric details into the register. This personal interview is a must for travellers who have not registered their biometrics after November 2, 2015. Once the Visa application process is completed the Schengen Visa will be issued and returned with your passport. What Documents Do You Need for Czech Republic Visa? There are several common documents that are required to be attached with Schengen Visa application forms. Passport – Attach your current passport. Ensure that it has been issued within the last 10 years and has a validity extending at least 3 months from your date of departure into the Schengen Area. The passport should have a minimum of 2 (TWO) blank pages for the Visa counterfoil to be attached. 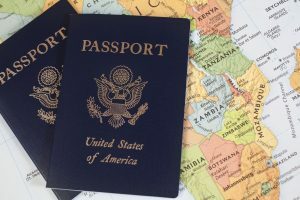 Visas – Attach copies of all previously-issued Visas on your current, and old, passport (if any). Photographs – Attach 2 (TWO) passport formatted photographs which have been taken at least within the last 3 months. It should be 35 mm x 45 mm in dimension and should have a matte white background. Itinerary – Attach copies of your flight tickets, showing the dates you are arriving in, and departing from, the Schengen Area. Apart from this, also attach a day-to-day list showing your plans to travel within the Schengen Are during your stay. Travel insurance – Attach a copy of valid travel insurance policy which provides cover to you during your entire stay in the Schengen Area. This travel insurance policy needs to be able to provide a cover of at least GBP 30,000, or more. Proof of Accommodation – Attach copies of your confirmed hotel bookings for the entirety of your stay in the Schengen Area. Proof of Means of Subsistence – Attach copies of a recent bank statement. This is to prove that you have sufficient funds in your bank account to cover all your expenses while you travel in the Schengen Area. In normal procedure, it takes around 15 days for the Visa processing department to make a decision on a Schengen Visa application, under Article 19. In case your Visa application is required to be scrutinized. Further, it may take anywhere between 15-39 days for the Visa application to get processed. In rare cases where additional documents may be required, it may take even 60 days for the Schengen Visa to be processed. Once the Schengen Visa is processed, you can choose to collect it in person from the Consulate Section, or the Visa Application Center. You can also have it couriered to a mailing address specified by you. Thomas Cook is a leading tour and travel service provider. Through all these long years of working, we have accumulated immense experience in all types of Visa applications. Our immense experience makes us efficient in managing Visa application processes for different types of Visas. We ensure that every customer gets end-to-end solutions for Visa processing. Our expertise in travel and tourism industry from the past many years has made us proficient in avoiding delays and unnecessary blocks when handling Visa applications. With us, you can relax knowing that your Visa application is in expert hands. Thomas Cook takes pride in the advanced level of transparency we show in our work. You will get regular updates about your Visa application process and can track the application in real-time yourself. Always choose Thomas Cook to ensure that you can enjoy the sites and wonders of Europe by letting us assist you with your Schengen Czech Republic Visa application. Also Read: Have You Tried Thomas Cook India’s Unique Online Visa Services Yet? How many times can I use my Schengen Visa? In case there is no specified limit of entries under the ‘Number of Entries’ field in the Visa counterfoil, such as 1 or 2, and ‘MULT’ is written then it allows the Visa-holder to enter and exit the Schengen Are unlimited number of times, as long as their complete stay does not exceed the number of total days allowed by the Visa. Who can apply for a Schengen Visa in India? A person having an Indian nationality, or a foreigner, legally residing in India is eligible to apply for a Schengen Visa from India. In special cases, a sufficient justification has to be given by foreign nationals applying for Schengen Visa from India. What if my Schengen Visa is rejected? In case you Schengen Visa is rejected, you will be notified, and a letter explaining the reasons for rejection will be provided when you collect your passport. When should I plan my trip to the Czech Republic? The best time of the year to enjoy the sights and sounds of the Czech Republic is during the spring and early fall seasons. The weather at this time is pleasant and mild, and there are significantly lesser numbers of tourists too.